Raised in Ilford by Irish parents, John Moloney won the All Ireland Fleadh at the tender age of fourteen utilising his skill on the accordion. During the Eighties, John became a musician on the Red Wedge tour which led to his first comedy incarnation ‘The Angry Young Accordionist’. After serving time on the burgeoning alternative comedy circuit the gags became more and more frequent and the accordion appeared less and less. John is now recognised as a true international class comedian although nothing is known on the fate of the accordion. The John Moloney Show was broadcast on BBC Radio 4 in 2015 and was named both Pick Of The Week and Pick Of The Year. At the time of writing (October 2017) it has just completed it’s second series. When not wowing audiences across the globe with his stand up, John is co-producer of the annual Balham Comedy Festival and occasionally performs stand up in German when performing in Hamburg and Berlin. 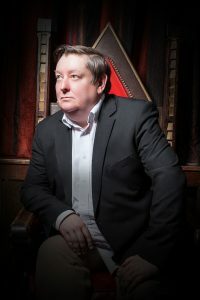 TV appearances include Grumpy Old Men, One Hundred Greatest Stand Ups, The Stand Up Show, Never Mind The Buzzcocks, They Think It’s All Over, Not A Lot Of People Know That, Call My Bluff, Noel’s Telly Years, Pebble Mill, Best of Edinburgh Festival and The Comedy Store .